Married Aura Furcal … has one daughter: Leila...Twitter: @leurygarcia1 … attended Liceo Ercilia Pepin School in San Francisco de Macoris, D.R. Was limited to 82 games due to three separate stints on the 10-day disabled list ... Appeared in 40 games (25 starts) in left field, 26 (20) in center field, 16 (10) in right field, seven (four) in second base, five (three) at shortstop and one (one) at third base … owned a .977 fielding percentage (4 E/175 TC) ... Owned the following averages: .337 (35-104) with runners on, .373 (25-67) with RISP and .333 (14-42) with RISP/two outs ... His numbers fell from .290/.323/.404 in the first half (58 games) to .227/.253/.307 after the break (24 games) ... Made his season debut as a pinch hitter on Opening Day (3/29) at Kansas City, recording a single … started his first game on 4/3 at Toronto in left field ... Registered his first multihit effort on 4/5 vs. Detroit … stole two bases on 4/9 vs. Tampa Bay ... Connected on his first homer of 2018 on 5/4 vs. Minnesota ... Left the game in the fifth on 5/23 vs. Baltimore and was placed on the disabled list on 5/24 with a left knee sprain ... Began an injury rehab assignment with Charlotte on 6/16, appearing in four games … was returned from his rehab assignment and reinstated from the disabled list on 6/22 ... Returned to the lineup in Game 1 of a doubleheader that night vs. Oakland, going 2-4 … matched his career high with four hits on 6/26 vs. Minnesota ... Connected on a solo home run on 7/5 at Houston … recorded two three-hit efforts in a span of three games on 7/13 and 7/15 ... Drove in a career-high four runs on 7/28 vs. Toronto ... Was on the 10-day disabled list from 8/6-17 with a left hamstring strain ... Left the game on 8/20 at Minnesota and was placed on the disabled list on 8/21 with a strained left hamstring ... Was reinstated on 9/22 … went 0-1 as a pinch hitter on 9/22 vs. the Cubs in his first game off the disabled list. Appeared in 87 games in his fifth season with the White Sox… recorded career highs in virtually every offensive category...Was on the disabled list twice during the season due to a sprained finger on his left hand and a sprained right thumb...Played the following positions: 51 games (47 starts) in center field, 24 (21) in left, six (six) in right, three (two) at second base and two (two) at shortstop … committed just four errors...Batted .302/.341/.349 with zero home runs vs. left-handers, compared to .257/.306/.453 with nine homers vs. righties... Went 12-35 (.343) with RISP/two outs … hit .265 (43-162) with 10 doubles, two triples, five homers, 19 RBI and six walks as the White Sox leadoff hitter (40 games)...Joined Willy García (left field) and Avisaíl García (right field) as the starting outfield on 4/14 at Minnesota, marking the first time in MLB history a starting outfield included three players with the exact same last name (Elias)...Matched his career high with three hits and scored twice on 4/24 vs. Kansas City … added three hits and two RBI on 4/25 vs. the Royals, marking the first time in his career he recorded consecutive three-hit efforts...Hit his second homer of the season on 4/26 vs. Kansas City… marked his second home run in a span of seven games after hitting two in his first 165 career games from 2013-2017...Hit safely in a career-high nine straight games from 5/5-16, batting .405 (15-37) with two doubles, two home runs, seven RBI and eight runs scored (five multihit efforts)... Recorded his first career multihomer game and matched his career high with three hits on 5/12 vs. San Diego...Had his hitting streak snapped on 5/17 at Los Angeles-AL...Drove in Chicago's only run with a solo homer, his fifth of the season, on 5/22 at Arizona... connected on his sixth home run on 5/24 at the Diamondbacks...Matched his career high with three RBI on 6/2 at Detroit...Was placed on the 10-day disabled list (retroactive to 6/16) on 6/19 with a sprained finger on his left hand … made three rehab appearances between the Arizona Rookie League White Sox and Class AAA Charlotte before being returned from the assignment and reinstated from the disabled list on 7/30...Made the start as the leadoff hitter and in left field on 7/30 vs. Cleveland … hit a game-tying, solo homer in the sixth...Hit a go-ahead, two-run single in the seventh on 8/12 vs. Kansas City … the Sox lost, 5-4, following Melky Cabrera's two-run home run in the eighth...Connected on his first career leadoff home run on 8/16 at the Dodgers … the first-pitch homer off Yu Darvish followed Tim Anderson's leadoff homer on the first pitch of the game on 8/15 at Dodger Stadium … marked the first time in White Sox history they recorded consecutive leadoff homers on the first pitch...Connected on his ninth homer on 8/23 vs. Minnesota...Was placed on the disabled list on 9/2 with a sprained right thumb and missed the remainder of the season. Spent most of the season with Class AAA Charlotte but played with the White Sox in September. Appeared in 16 games in center field, including 14 starts … hit .234 (11-47) with a double, triple, home run, five RBI and five runs scored as a starter. Was recalled from Charlotte on 9/6 and made his season debut that night as the starting center fielder vs. Detroit (0-3). Started each of the White Sox last nine games from 9/24-10/2 … hit a triple and his second career home run and drove in three runs on 9/27 vs. Tampa Bay. Ranked among the Charlotte leaders in triples (1st, 4), runs scored (1st, 45), hits, (2nd, 97), average (2nd, .313), on-base percentage (2nd, .367) and stolen bases (2nd, 18). Was named an International League midseason All-Star but did not play in the game at BB&T Ballpark in Charlotte. Hit .319/.386/.444 vs. right-handers and .298/.320/.383 vs. left-handers … batted .383 (18-47) with two doubles, seven RBI and a .412 on-base percentage over 15 June games. Hit his first home run of the season and recorded three RBI on 4/24 at Toledo … registered four hits on 5/12 at Norfolk. Recorded three straight multihit efforts from 5/21-26 …owned 10-game hitting streaks from 6/14-28 and 8/10-19. Drove in a season-high six runs on 8/25 vs. Durham … hit safely in each of his last five games with the Knights from 9/1-5. Played in 30 games for Cibao in the Dominican Winter League, hitting .266 (29-109) with five doubles, three triples, eight RBI and seven stolen bases. Spent his first full season in the major leagues...Appeared in 15 games (11 starts) at third base, 14 (11) at second, 14 (eight) in center field, nine (three) at shortstop, three (none) in right, two (one) in left and one game at pitcher...Ranked fourth on the club with 11 stolen bases … entered 18 games as a pinch runner, scoring four runs with seven steals...Hit .269 (7-26) in April (.143 over the remainder of 2014)...Scored the game-ending run on a wild pitch on 4/2 vs. Minnesota after reaching base on a bunt single...Suffered the loss in his first career pitching appearance on 4/16 vs. Boston (2 ER/1.0 IP) … retired the first two batters in the 14th inning before walking consecutive hitters and surrendering a game-winning, two-run double to Jackie Bradley Jr...Was the first White Sox position player to pitch since Casper Wells on 6/28/13 vs. Cleveland...Went 2-3 on 6/4 at Los Angeles-NL, including his first career home run, a solo shot off Josh Beckett...Connected on a game-ending, RBI single in the bottom of the ninth inning on 7/2 vs. the Angels...Recorded a RBI in three straight games from 7/11-13...Started five straight games from 8/5-9 (three in center and one each at second and third)...Played for Puerto Rico in the Caribbean World Series. Spent time with Texas, Class AAA Round Rock, Class AAA Charlotte and the White Sox … made the Rangers Opening Day roster … appeared in 12 games at second base (nine starts), four at shortstop (two) and four at third (two) … made his major-league debut on 4/6 vs. Los Angeles-AL … recorded his first hit on 4/13 at Seattle (off Joe Saunders) and his first triple on 4/14 at Seattle … went 3-6 with four runs scored and a stolen base on 5/12 at Houston … was optioned to Round Rock on 6/15 … played 42 games at shortstop and five in center field with the Express … was acquired by the White Sox on 8/11 as the player to be named later to complete the 8/9 trade that sent outfielder Alex Rios and cash considerations to Texas … was optioned to Charlotte and recalled by the Sox on 8/22 … appeared in 18 games with the White Sox, including six starts at second base, four in center field and two at shortstop … led off six times … recorded a pinch-hit single in his White Sox debut on 8/23 vs. Texas … made his first start as the second baseman on 8/27 vs. Houston … matched his season high with three hits on 9/11 vs. Detroit … hit safely in three straight games from 9/18-25 … threw out Oswaldo Arcia from shallow right field on 9/18 vs. Minnesota … hit a combined .265 (59-223) with four triples, four home runs, 20 RBI, 15 stolen bases and 34 runs scored in 55 games between Round Rock and Charlotte … hit leadoff 46 times with Round Rock … batted .317 (19-60) with two home runs and 14 RBI in June … hit safely in six of his eight games with the Knights … entered the season ranked by Baseball America as the No. 20 Prospect, Fastest Baserunner and Best Infield Arm in the Texas organization … played with Cibao in the Dominican Winter League … made one appearance (0-1) as a pinch hitter for the Dominican Republic in the World Baseball Classic. Spent full season with Frisco...selected as the fastest baserunner and best infield arm in the organization by Baseball America...ranked among the Texas League leaders in triples (2nd, 11) and stolen bases (5th, 31)...shuffled between second base and shortstop, while also starting 4 games in center field...batted .317 (33-104) against left-handers and .282 (77-273) versus right-handed pitchers...hit .309 (21-68) with 2 doubles, 3 triples, 2 RBI, and 6 runs over first 18 games...was on the disabled list from April 27-May 23 with a hip strain...batted .342 (13-38) with a double, 2 triples, home run, and 7 RBI over first 9 games upon activation from disabled list...hit just .223 (23-103) over 25 games in June, the lone month with a sub-.300 average...batted .314 (58-185) with 6 doubles, 5 triples, a home run, 16 RBI, and 33 runs following the All-Star break...closed out the season with a .366 average (26-71) over final 22 games...batted .226 (7-31) with 2 doubles, a home run, and 3 RBI over 7 games during the Texas League playoffs...hit a 10th inning, walk-off home run in Game 2 of the South Division Championship Series against Corpus Christi...WINTER BALL: Played 37 games for Cibao in the Dominican Winter League, batting .285 (41-144) with 5 doubles, a triple, 2 home runs, and 10 RBI...batted .354 (23-65) with 11 runs, 3 doubles, a triple, and 9 RBI over 18 games during the DWL playoffs...ranked among the playoff leaders in OBP (2nd), batting (3rd), hits (T4th), and runs (T4th)...last game was Jan. 22. Spent entire season with Myrtle Beach...tabbed the 11thbest prospect in the Texas organization following the season...named the 16th-best prospect and fastest baserunner in the Carolina League by Baseball America...tied for the 6th-most stolen bases (30) on the circuit...selected as the Carolina League's Topps Player of the Month for June, batting .342 (38-111) with 2 home runs, 14 RBI, and a league-best 10 stolen bases...was on disabled list, August 15-29, with sprained shoulder...hit .316 (6-19) over 4 games during the CL playoffs...batted .361 (30-83) with 6 doubles, 2 triples, 3 home runs, and 12 RBI in 20 games for the Surprise Saguaros in the Arizona Fall League...finished among the AFL leaders in batting (5th) and stolen bases (T6th, 7). Spent the entire season with Hickory...tallied the most stolen bases among Texas minor leaguers and the 4thmost in the South Atlantic League despite missing over a month due to injury...was successful on 47-of-56 (83.9%) stolen base attempts...batted .299 (29-97) against lefties and .248 (65-262) vs. right-handers...hit .255 (67-263) prior to the All-Star break and .281 (27-96) following the break, including .309 (21-68) over 18 games in August...placed on the disabled list June 27 with a right shoulder strain...went 1-for-3 with a double in rehab assignment with AZL Rangers on July 8 at AZL Indians, but re-aggravated injured shoulder...batted .533 (8-15) with a double and 2 RBI in 2nd rehab assignment with AZL Rangers from August 4-9...activated from disabled list on August 10. Spent entire campaign with Hickory...voted as the "Top Defensive Shortstop" in the South Atlantic League by Baseball America...recorded at least one hit in each of his first 8 games with the Crawdads, batting .310 (9-29)...hit .355 (22-62) from June 7-July 1, raising season average from .196 to .283. Spent entire first professional season with AZL Rangers. September 22, 2018 Chicago White Sox activated LF Leury Garcia from the 10-day injured list. 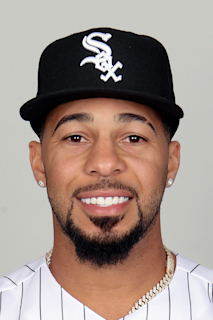 August 21, 2018 Chicago White Sox placed LF Leury Garcia on the 10-day disabled list. Strained left hamstring. August 17, 2018 Chicago White Sox activated LF Leury Garcia from the 10-day disabled list. August 6, 2018 Chicago White Sox placed LF Leury Garcia on the 10-day disabled list. Left hamstring strain. June 22, 2018 Chicago White Sox activated LF Leury Garcia from the 10-day disabled list. June 16, 2018 Chicago White Sox sent OF Leury Garcia on a rehab assignment to Charlotte Knights. May 24, 2018 Chicago White Sox placed CF Leury Garcia on the 10-day disabled list. Left knee sprain. December 2, 2017 OF Leury Garcia assigned to Gigantes del Cibao. October 2, 2017 Chicago White Sox activated CF Leury Garcia from the 10-day disabled list. September 2, 2017 Chicago White Sox placed CF Leury Garcia on the 10-day disabled list. Sprained right thumb. July 30, 2017 Chicago White Sox activated CF Leury Garcia from the 10-day disabled list. July 29, 2017 Chicago White Sox sent OF Leury Garcia on a rehab assignment to Charlotte Knights. July 26, 2017 Chicago White Sox sent CF Leury Garcia on a rehab assignment to AZL White Sox. June 19, 2017 Chicago White Sox placed CF Leury Garcia on the 10-day disabled list retroactive to June 16, 2017. Sprained finger on left hand. January 30, 2017 OF Leury Garcia assigned to Dominican Republic. October 31, 2016 OF Leury Garcia assigned to Gigantes del Cibao. September 6, 2016 Chicago White Sox recalled CF Leury Garcia from Charlotte Knights. August 7, 2016 Charlotte Knights activated LF Leury Garcia from the 7-day disabled list. July 4, 2016 Charlotte Knights placed 2B Leury Garcia on the 7-day disabled list. June 24, 2016 Charlotte Knights activated 2B Leury Garcia from the temporarily inactive list. June 21, 2016 Charlotte Knights placed 2B Leury Garcia on the temporarily inactive list. June 14, 2016 Charlotte Knights activated 2B Leury Garcia from the 7-day disabled list. June 10, 2016 Charlotte Knights placed 2B Leury Garcia on the 7-day disabled list retroactive to June 7, 2016. May 6, 2016 Charlotte Knights activated 2B Leury Garcia from the 7-day disabled list. April 29, 2016 Charlotte Knights placed 2B Leury Garcia on the 7-day disabled list retroactive to April 28, 2016. March 29, 2016 Chicago White Sox optioned 2B Leury Garcia to Charlotte Knights. January 30, 2016 2B Leury Garcia assigned to Dominican Republic. December 27, 2015 OF Leury Garcia assigned to Leones del Escogido. October 16, 2015 2B Leury Garcia assigned to Gigantes del Cibao. October 16, 2015 2B Leury Garcia roster status changed by Gigantes del Cibao. September 1, 2015 Chicago White Sox recalled Leury Garcia from Charlotte Knights. August 14, 2015 Chicago White Sox optioned 2B Leury Garcia to Charlotte Knights. July 29, 2015 Chicago White Sox recalled Leury Garcia from Charlotte Knights. July 26, 2015 Chicago White Sox optioned 2B Leury Garcia to Charlotte Knights. July 23, 2015 Chicago White Sox recalled Leury Garcia from Charlotte Knights. July 4, 2015 Charlotte Knights activated 2B Leury Garcia from the 7-day disabled list. June 24, 2015 Charlotte Knights placed 2B Leury Garcia on the 7-day disabled list. March 24, 2015 Chicago White Sox optioned 2B Leury Garcia to Charlotte Knights. January 28, 2015 OF Leury Garcia assigned to Dominican Republic. October 31, 2014 2B Leury Garcia assigned to Gigantes del Cibao. January 30, 2014 2B Leury Garcia assigned to Dominican Republic. October 18, 2013 2B Leury Garcia assigned to Gigantes del Cibao. August 22, 2013 Chicago White Sox recalled 2B Leury Garcia from Charlotte Knights. August 12, 2013 Chicago White Sox optioned Leury Garcia to Charlotte Knights. August 11, 2013 Chicago White Sox optioned Leury Garcia to Charlotte Knights. August 9, 2013 Chicago White Sox traded RF Alex Rios to Texas Rangers for 2B Leury Garcia. June 15, 2013 Texas Rangers optioned 2B Leury Garcia to Round Rock Express. December 27, 2012 SS Leury Garcia transferred to Aguilas Cibaenas from Gigantes del Cibao. November 20, 2012 Texas Rangers selected the contract of Leury Garcia from Frisco RoughRiders. May 24, 2012 Leury Garcia roster status changed by Frisco RoughRiders. April 28, 2012 Frisco RoughRiders placed SS Leury Garcia on the 7-day disabled list. Left hip flexor injury. April 2, 2012 SS Leury Garcia assigned to Frisco RoughRiders from Myrtle Beach Pelicans. March 16, 2012 SS Leury Garcia assigned to Texas Rangers. November 26, 2011 Leury Garcia assigned to Gigantes del Cibao. August 29, 2011 Leury Garcia roster status changed by Myrtle Beach Pelicans. August 20, 2011 Myrtle Beach Pelicans placed SS Leury Garcia on the 7-day disabled list. March 31, 2011 SS Leury Garcia assigned to Myrtle Beach Pelicans from Hickory Crawdads. March 1, 2011 SS Leury Garcia assigned to Texas Rangers. August 10, 2010 Leury Garcia roster status changed by Hickory Crawdads. July 8, 2010 sent SS Leury Garcia on a rehab assignment to AZL Rangers. June 30, 2010 Hickory Crawdads placed SS Leury Garcia on the 7-day disabled list. March 6, 2010 SS Leury Garcia assigned to Texas Rangers. October 16, 2009 SS Leury Garcia assigned to Gigantes del Cibao. May 21, 2009 SS Leury Garcia assigned to Hickory Crawdads from AZL Rangers.